How are your weekends going? We're just popping by to do another Show & Tell Sunday, to share some of the gorgeous work that you guys have been creating. It's so nice to spend a moment having a look at other peoples makes. It's very inspiring indeed! We're definitely in need of the inspiration at the moment, as both of us are bursting with enthusiasm to get working on a new project. However, neither one of us it totally sure what we want to make and what that new project will be. 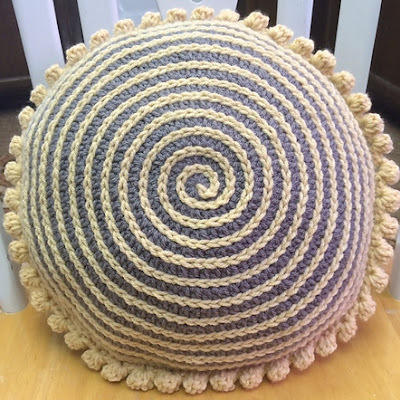 Gail has done such a great job with our Spiral Cushion Pattern. She's picked some gorgeous colours that really contrast with one another, as well as complimenting each other perfectly! The yarn is by Hobby Lobby in the shades Samoan Sand and Gray beard. We just love them! Gail's pillow measures about 13" and is stuffed with polyester fibre fill. Finally to finish of the hypnotic spirals, Gail has bordered her cushion with a rather cute and neat looking Bobble Stitch Border. 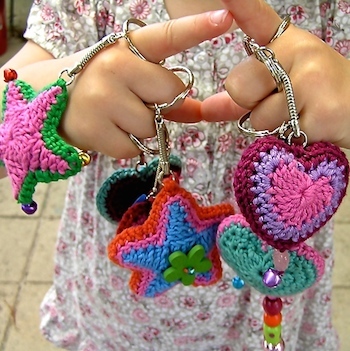 We just love the effect and finish that this stitch brings to her project! Great work Gail!! If you have two minutes also check out Gail's fantastic Etsy store she has some gorgeous makes for sell! We just LOVE what Thommy has done with our Eagle Twist pattern! He used the short row sections to create an "ombre" effect and we're almost upset we didn't think of it first! The colours he chose are just beautiful and he cleverly used a grey colour to really make the blue gradient stand out. Thommy also wrote down lots of notes and information about his process of making the scarf on his Ravelry project page which is always very helpful! 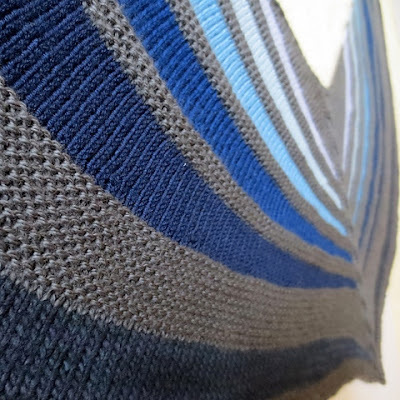 Why don't you pop by his Ravelry page and see what other beautiful projects Thommy has made! What a great idea Bethan has come up with! 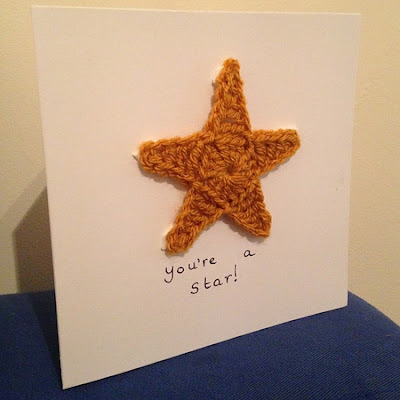 Bethan has made this cute card and has used our simple star pattern as the design feature to really get the cards message across! We think that this is a super idea! This idea would work great for cards to send to "your little stars" (as Bethan has done), but also as a great Christmas card idea?! Bethan has lots of other amazingly well thought out projects over on her Ravelry page, so why not pay her a visit for a dose of inspiration!! Have Your Projects featured on our next "Show & Tell"? If you have a Boys & Bunting make that you’d like to share with us, simply follow the link to the Show & Tell Page. You’ll be able to fill in your project details, as well as upload a photo of your project. 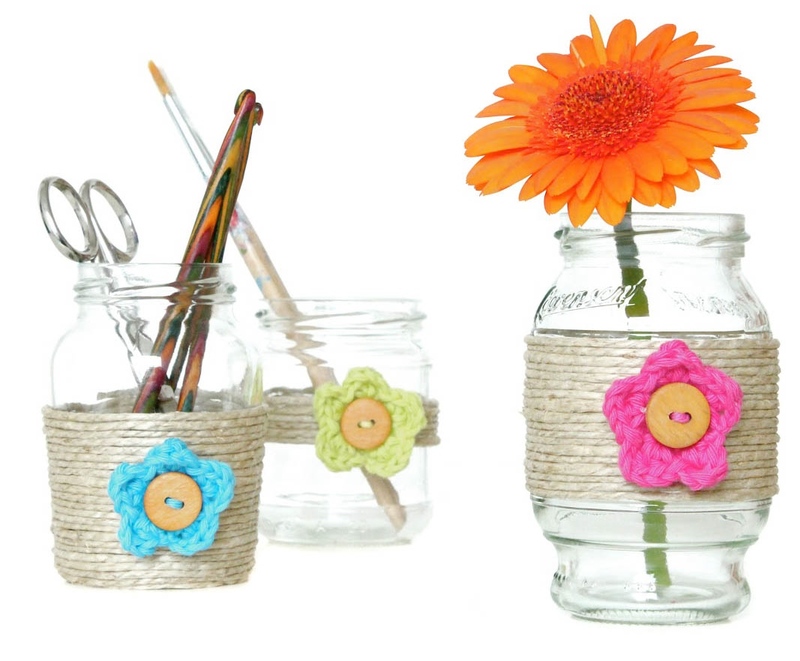 We look forward to seeing what you’ve been making and seeing the creative spin that you’ve put on our patterns! I'm over the moon to see my project here! Sorry to almost upset you ;) It was such a fabulous pattern and making it had me so inspired. Seeing other people's projects is really cool too and I will have try out some of the ideas being showcased. I'm absolutely loving this blog - thank you guys! Thommy!!! Thanks for your message! We're over the 'moonER' to have your project here 😉 !! !